during the month of March! challenges that are posted each Monday. 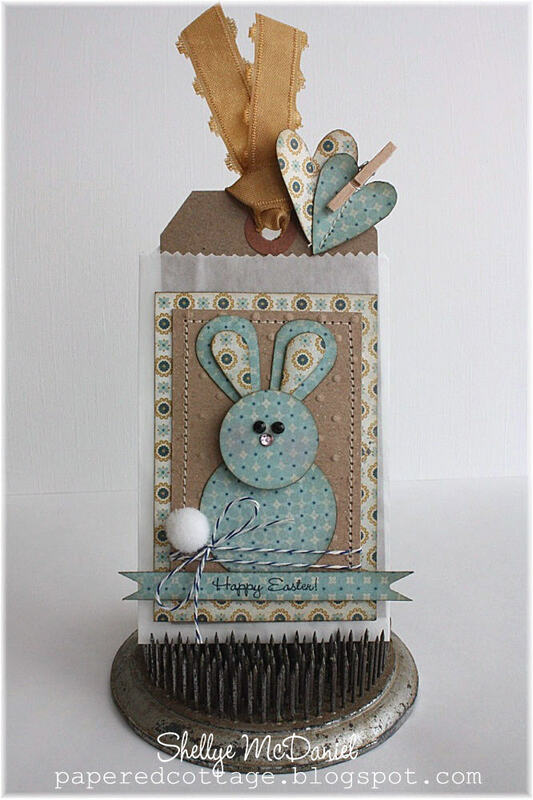 Brown Kraft Notecard, Tiny Wooden Clothespins, Yellow Library Card and Precut Chipboard. I incorporated an oval scallop punch to create the shapes of the banner, as well as a scalloped border punch and butterfly punch. 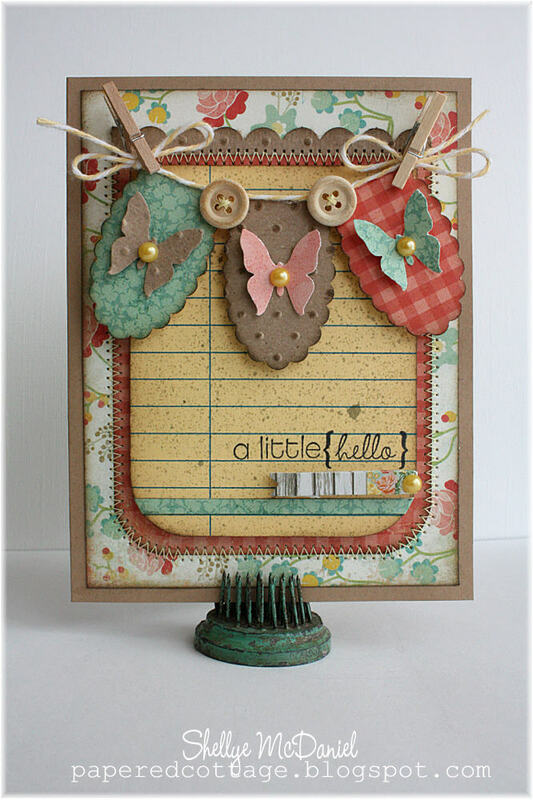 The precut chipboard looks beautiful embossed with swiss dots! Ink around the edges of patterned papers and machine stitch together if desired. Apply scallop banner to top of card with foam dots. 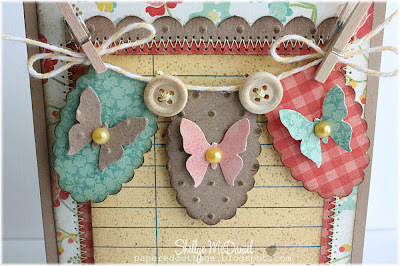 Add a small pearl accent to the center of each butterfly and glue to center of banner. String a small bit of baker's twine across the top of banner and tie into a bow at each end. Clip on tiny wooden clothespins to each end. Stamp sentiment at the lower bottom right. Before assembling the card, corner round the bottom portion of the patterned papers. Finally, glue onto the brown kraft notecard. perfect for adding to a gift bag, scrapbook page, card or use as a place setting marker. For this project, I used the Kraft Outlet's Brown Kraft Tag, Small Glassine Bag, Precut Chipboard, Blue Baker's Twine and Tiny Wooden Clothespin. 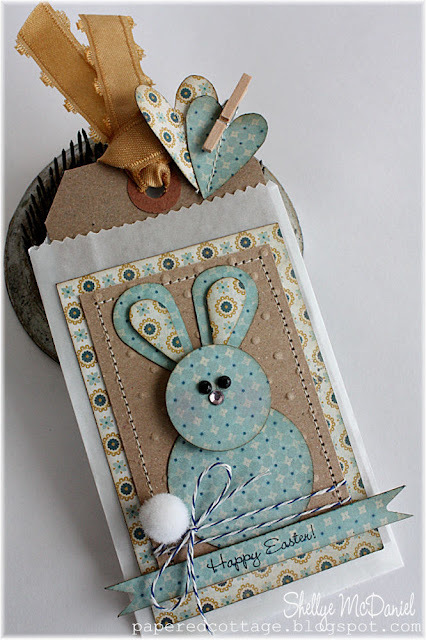 For the shapes, she incorporated a 1" and 1.5" circle punch; and heart punch to create the bunny. For the ears, she cut the heart in half. Folding a small piece of patterned paper in half, I hand-cut a couple of shabby hearts. To create an easy pennant banner look, use a star punch to create the fish tail appearance! I also used the same embossed swiss dot precut chipboard (from above) as the background for the bunny; wrap baker's twine around chipboard a couple of times and tie into a bow; machine stitch to patterned paper. Glue to front of glassine bag. A small white pom pom was glued in place to create the bunny's cotton tail. Rhinestone accents were used for the eyes and nose; a bit of blush was applied for the cheeks. I simply tied on a piece of ribbon through the kraft tag and then clipped on the hand-cut hearts with a tiny wooden clothespin. Now, don't these projects make you ready for Spring? As you can tell...I am! both of these are FABULOUS! These are both full of sweetness! Love your blog! I enjoy scrap booking myself! There's one thing I have noticed you've done with your die cuts that I'm wondering how to do. That is the burned edge look. It looks vintage, but I don't know how to get it to look that way. Is there a machine you use? I would appreciate any feedback. Thank you and best of luck! Jennifer, I use an inexpesnive walnut ink pad ($2.99 at Hobby Lobby) and removed the top 'felt' portion...it leaves more of a nubby, felt texture. I rub it across the edges of anything that I'm wanting to distress. To reink, I just rub it onto a 'good' walnut ink pad. I think I'm going on about three years with this same scruffy pad LOL Tim Holtz carries blending pads that also work well for distressing your edges. Just remember to rub off the excess before you start using it on your project ;) Hope that helps! Love this! Thanks so much for using the products from Kraft Outlet.